PARIS — Tactical voting by Socialist voters kept Marine Le Pen's National Front out of power in its three main target regions in French regional elections on Sunday, handing power in all of them to the conservatives of former president Nicolas Sarkozy, exit polls showed. Le Pen's far-right, anti-immigration FN won more votes than any other party nationally in last week's first round, boosted by fears about security and immigration after the attacks in Paris a month ago that killed 130 people. But after that first round result, the best in the FN's history, the Socialist Party withdrew its candidates in the north, where Le Pen was the main candidate, and in the south-east, where her niece Marion Marechal-Le Pen was running, urging its supporters to vote for Sarkozy to keep the FN out of power. Sarkozy's The Republicans and center-right allies took 57.5 percent of the vote in the northern region, where Le Pen was standing, against her 42.5 percent, the Ifop Fiducial poll for iTELE, Paris Match and Sud Radio showed. In the southeast, where Marechal-Le Pen was the FN's lead candidate, the conservatives scored 54.5 percent and the FN 45.5, the poll said. In the eastern region, where the Socialists did not withdraw but where the FN also did well in the first round, the center right won 48.4 percent against the FN's 36.4 percent, according to a separate poll by TNS-Sofres-One Point. If confirmed, the results would be a disappointment for Le Pen, who had hoped to use victories as a springboard for presidential and general elections in 2017. 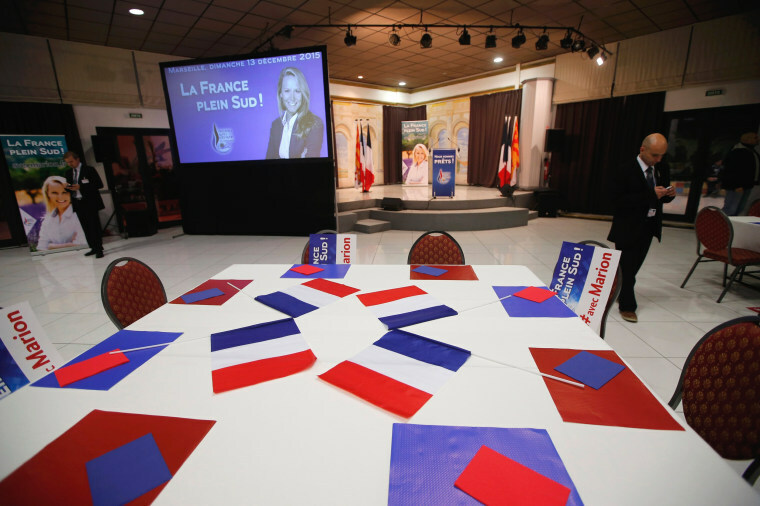 Results in all of the 13 regions of mainland France were expected later in the evening. The FN's first-round breakthrough last week drew strength from fears over Europe's refugee crisis and the Islamic State militant attacks on Nov. 13.